Our annual new year gourmet dinner was held January 2, giving us a day’s break from New Year’s Eve dinner, and the day following (today) to rest up before heading back to work. Feeling that soup might be too heavy a starter for also fairly heavy main course. A sense that I didn’t really want to kill anything to ring in the new year, but that frozen lobster might be sub-par. So, we went back to a fairly standard item at these dinners, wild mushrooms. But a new recipe, from Fine Cooking magazine. Add 1 Tablespoon buttermilk to 1 cup slightly warm whipping cream. Let that sit on your kitchen for about a day and half, stirring every once in a while, til it’s thick. Isn’t that weird? You’d think leaving dairy products out at room temperature for so long would be a bad thing, but we did eat that yesterday with no ill effects, so I guess not. (I also don’t understand why that’s called crème fraîche, which literally means fresh cream.) It didn’t seem to impart that much taste to the dish, which mostly tasted of mushrooms. I think it was more about adding texture. The wine we had with this course was a 2007 California Beringer Pinot Noir. We’d bought it that same day, in the “last chance” bin, just on the thought that Pinot would be good with mushrooms. Turned out to be a very nice wine. The recipe we used here was from the New England Culinary Institute, and we picked it up while on vacation in Vermont. It was super-easy, though; the most challenging part, which Jean took on, was peeling and slicing the mango. Half a mango decorated the plates, and the rest was blended with ingredients like ginger, white wine, and clove, to make a coulis. Happily, we were able to find some beautiful, large sea scallops at Sobey’s, and then you don’t have to do much to them. Salt, pepper, sear in a bit of grapeseed oil, then drizzle on a bit of olive oil. I guess the soundtrack for this portion—the Thoughtful playlist—wasn’t quite as effective. This was the one course planned well ahead, when I spotted the venison osso bucco cuts at Brady’s. I then scoured the Internet for recipes, since I’d never made any kind 0f osso bucco before. I finally settled on a recipe from cdkitchen.com, which involved cooking it with lemons, oranges, carrot juice, red wine, juniper berries (which I couldn’t find, so I substituted gin), chicken broth, and various veggies. It wasn’t too hard at all. Unfortunately, the results were disappointing. For whatever reason—having to scale down the recipe size, not using the best pots, whatever—the meat just wasn’t tender enough. It was tasty, but lacked that “falling off the bone” quality. If I try it again, I think I’ll go for a slow cooker method. The barley side dish, though deliberately unexciting, was quite nice. I started with a recipe from Taste of Home, but made some changes: Cooked it in chicken broth instead of just water, used carrots instead of red peppers, and reduced the amount of green onion. The California Zinfandel wine we had with this was a Christmas gift this year, and man, that was a lot of wine. Big and fruity. Nice, though. Soundtrack was an old standby for dining, my Beautiful Ones playlist. I wanted a light (tasting) dessert to round things off, and what could be lighter than soufflé? I’d never made it before, either, so again I had to search online for recipes. I ended up with a highly recommended one from Epicurious.com, which had the added bonus of being fine with making everything ahead and just baking it right before eating. The ingredients were really simple: eggs, milk, sugar, and 10.5 ounces of “extra-bittersweet chocolate”. It was easily the most fun dish to prepare, starting with the need to round up six soufflé ramekins when we had no idea what those were. And the word just struck us as really funny, so we were giggling the whole time we gathered a dog’s breakfast of custard dishes, small corningware, and oven-safe storage containers we figured could substitute for ramekins. Then it was all beating egg whites and melting chocolate and buttering and sugaring the faux ramekins, not to mention really enjoying licking all the bowls and spoons. While we considered port, we decided to open a Cabernet France ice wine from Stratus (a gift we received last Christmas) to serve with the soufflé. It was lovely. This (unsurprisingly for me) was my favorite dish of the night. (And Jean’s #2.) The soundtrack for this portion of the evening was, of course, “Love, the sweetest thing” (that is, romantic songs). 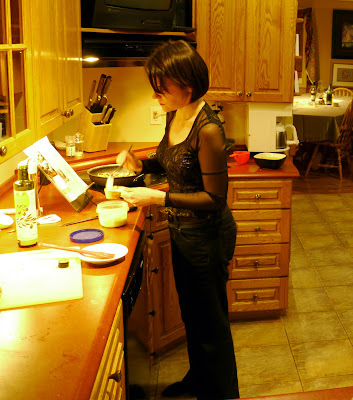 Categories: Food, Personal | Tags: cooking, home, New Year's, wine | Permalink. Cathy, your dad forwarded this to me and I am so impressed. Your culinary ability amazes me. You have this great little figure and you obviously love food. By the way, your home looks lovely with a great collection of pictures. Your January 2nd menu was ambitious,interesting, well-researched and explained, and the fact that you served 4 kinds of wine throughout dinner was impressive. How many guests did you entertain at that dinner? When can we go to visit? Seriously, I am very proud of your accomplishments. Your pictures and descriptions of your travels are thorough and excellent. They will be helpful if we finally go to the UK. The comments re your meal are detailed and helpful, so well done, right down to the background music you played. You are a smart young lady. So glad that your dad shared with us. Thanks for all the kind words! I sometimes do wonder why I don’t weigh more given my food fondness, but I do assure you that molten chocolate and creme fraiche mushrooms are not part of my daily diet! As for guests, there were only two: me and Jean! Peculiar amount of effort for just us, I guess, but it’s become our new year’s tradition. Cathy, thanks for email in case I did not check your site. I am even more impressed that you did all that work just for you two. Sharyn, who also loves to cook, was impressed too. If more couples did what you two do there would be fewer divorces, perhaps! !